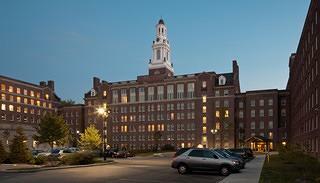 The former St. Luke's Hospital was rehabilitated thanks to $36.7 million in tax credits. When it was built in 1927, St. Luke’s Medical Center was the biggest point of pride in Cleveland’s Buckeye neighborhood. The sprawling neo-Georgian-style medical facility was one of the most advanced medical centers of its time, and generations of Clevelanders passed through its doors on the occasions of births, deaths, and everything in between. Buckeye’s fortunes took a turn for the worse in the 1960s, when former city-dwellers moved to the suburbs in record numbers. When St. Luke’s Hospital closed its doors in 1998, it left 800 people unemployed and a large vacancy on Shaker Boulevard, which links Buckeye with the more affluent suburban community of Shaker Heights. St. Luke’s was vacant for a total of eight years, and things weren’t looking good; it was the target of vandals and copper wire prospectors, and moisture damage severely eroded the plaster on the building’s interior. In 2006, the community development organization Cleveland Neighborhood Progress (CNP) came up with what some may have called a far-fetched plan to put it back into use. 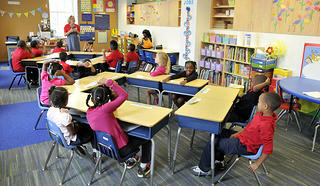 Students at the Intergenerational School in St. Luke's Manor. The total cost of the project tallied up to $63 million. CNP utilized $25 million in low-income housing tax credit and federal historic equity, $11 million in New Markets Tax Credits, $5.5 million in loan financing, and a $25,000 Enterprise Green Communities grant, as well as HUD funding and other city and state funding channels, to finish the project's first two phases. Ultimately, they still had to conduct a $7.5 million capital campaign to finish it off. CNP started construction in October of 2010, and finished in the spring of 2014. Despite the extensive interior and exterior damage and deterioration, Mortensen says that the building’s overall structure was sound. The entirety of the facade was tuckpointed, and CNP spent $638,000 on custom-made metal windows alone. Today, the St. Luke’s Manor complex, as it is called, is home to nine different tenants. There were numerous challenges posed by the sprawling structure’s rehabilitation, but Mortensen says that the financing was by far the biggest. The largest reward, however, came when students at the K-8 Intergenerational School walked through the halls for the first time. “At one point during the morning of the first day … one of the children leaned over to the other and said, ‘This looks just like Hathaway Brown [a private school. ]’ And the thought that these urban kids from very different economic backgrounds, many of them on free and reduced lunch, [consider themselves] to be attending a school of the same quality, is very meaningful to us,” he says. A few final finishing touches, including some recreational spaces that will be shared by the students and seniors, are still pending. But for residents of Buckeye, after 19 years, St. Luke’s Hospital is once again something to be proud of.